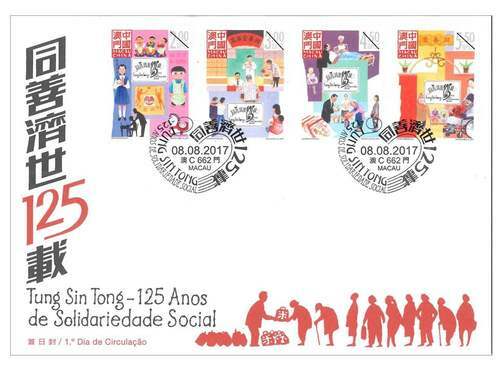 Stamp Issue "Tung Sin Tong – 125 Years of Society Solidarity"
Macao Post and Telecommunications Bureau will issue the stamp theme “Tung Sin Tong – 125 Years of Society Solidarity” on 8th August, 2017. 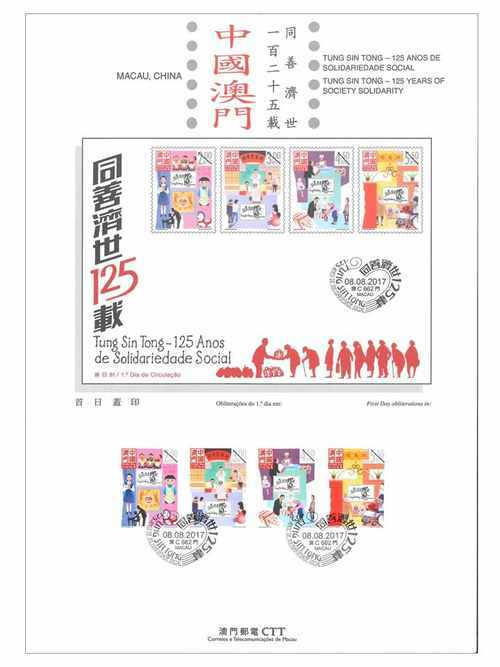 This is the same theme after the stamp “Centenary of Tung Sin Tong Charitable Society” issued in 1992 and “120th Anniversary of Tung Sin Tong Charitable Society” issued in 2012. 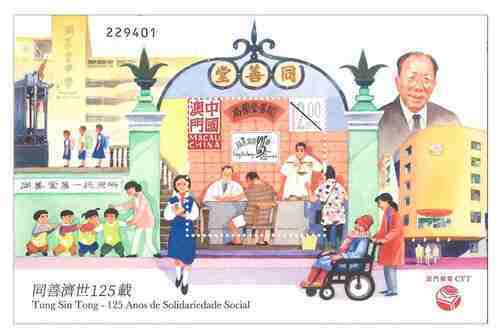 Tung Sin Tong was established in 1892 (18th year of Emperor Guangxu of Qing Dynasty) with a history of 125 years, which is one of the most time-honoured charitable societies in Chinese community in Macao. At the beginning, it was initiated by a group of Chinese merchants in Hong Kong and Macao who are passionate about charitable activities, and the “Tung Sin Villa” was formed. The purpose is to gather the capable persons from all sectors in Chinese community in Macao to achieve the goal of Chinese people saving themselves; working together to help the old, weak and poor people among the Chinese community of Macao during that time. 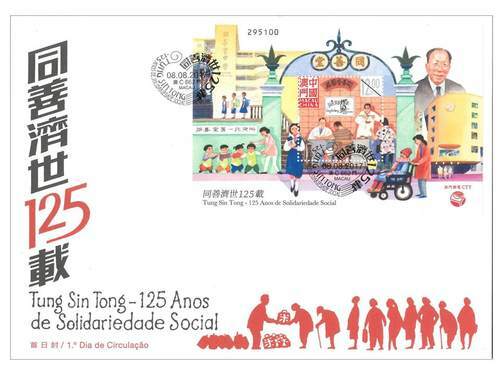 Subsequently on 1st December of 1892, it applied at the then Macao-Portugal Government to become a formal charity organisation. 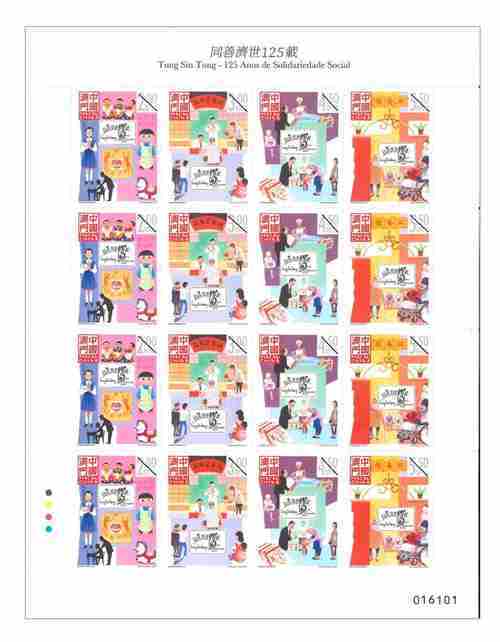 This issue includes a set of four stamps and one souvenir sheet, the stamps illustrate the major daily services of Tung Sin Tong including the Free Nursery Services, Free Education, Free Medical Services, Free Social Assistance, and Free Elderly Services. 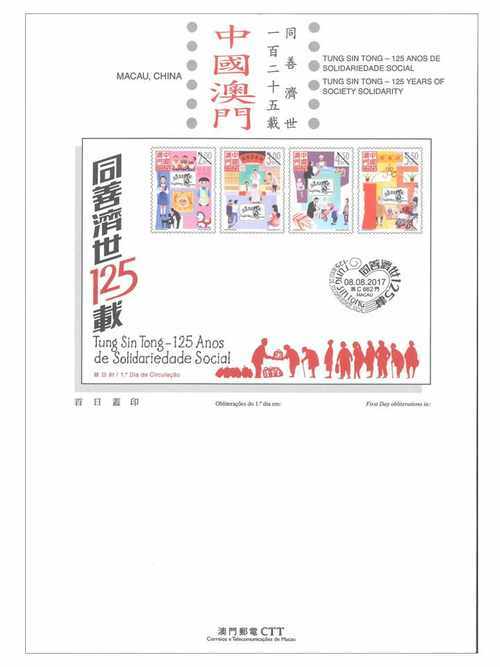 The stamp designer of this issue is Mr. Lio Man Cheong, and the text of the information brochure is written by the Tung Sin Tong Charitable Society. This is the seventh theme in 2017. 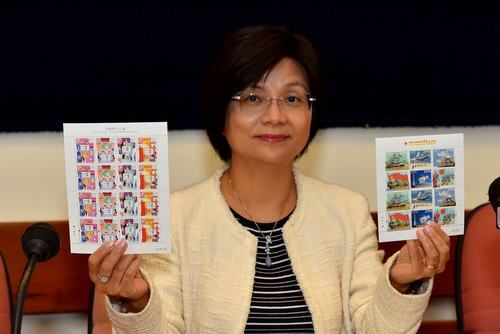 The previous issued stamps are “Lunar Year of the Rooster” on 05/01/2017, “Macao: Back to Common Roots” on 10/02/2017, “Traditional Chinese Culture” on 01/03/2017, the label stamp “Lunar Year of the Rooster” on 17/05/2017, “Chinese Opera – Farewell My Concubine” on 08/06/2017, “Social Welfare Services of Macao” on 03/07/2017, and “90th Anniversary of the Founding of the Chinese People’s Liberation Army” to be issued on 01/08/2017. 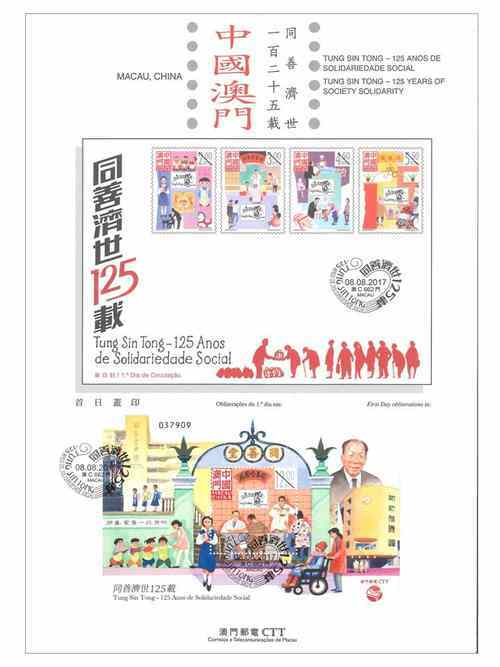 Technical Data of Stamp "TUNG SIN TONG – 125 YEARS OF SOCIETY SOLIDARITY"